Perjury is the act of intentionally lying, or telling an untruth, whether verbally or in writing, while under oath in an official proceeding. The act of perjury is only considered a crime under certain specific circumstances, the details of which vary by jurisdiction. The courts view perjury as a serious offense, as lying and misrepresenting facts given in testimony, effectively usurps the power of the court system. Perjury applies only to statements of fact, not opinion, or interpretations. To explore this concept, consider the following perjury definition. noun. 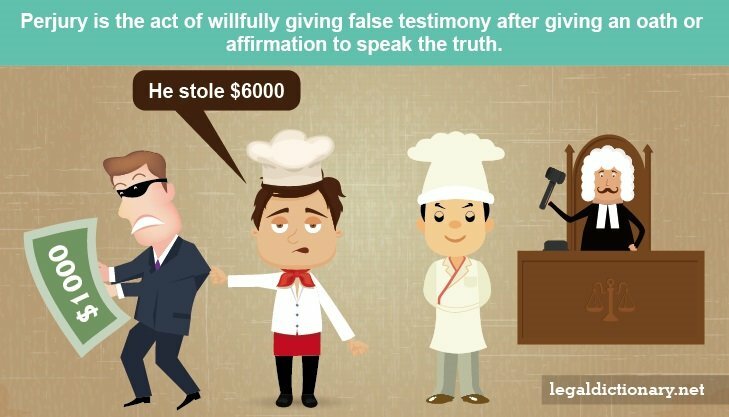 The act of willfully giving false testimony after giving an oath or affirmation to speak the truth. Juries and judges base their verdicts, in both civil and criminal matters, on evidence provided, and testimony given. Requiring a witness to take an oath of truth is intended to dissuade him from telling untruths during testimony, but for many individuals, the oath itself has no teeth. Stiff penalties for perjury help ensure the truth is told. While perjury may be committed by an individual under a sworn oath during a trial, it also applies to oaths in other legal situations, such as depositions, and affirmations of the truth of written statements or facts. Both state and federal laws make perjury a crime, the basic definition of which is the same, though penalties may vary. An individual who lies under oath in a federal court, or who lies to a person acting on behalf of the federal government, has committed a felony, and faces prison time of up to five years. On the state level, perjury may be either a misdemeanor or felony, depending on the circumstances. Generally, the more serious the proceeding, the stiffer the penalty. In many cases, telling a lie under oath is a misdemeanor crime. Lying under oath about facts that are material, or important to the outcome of the case, is a felony. The individual must have been sworn in, be under oath, or have made a solemn promise or affirmation to tell the truth. The individual must have made the false statement intentionally and willingly. In most jurisdictions, the false statement made by the individual must have been important to the case. For instance, a witness who lies about his whereabouts during the crime is committing perjury. If he lies about how long he has worked for his employer may not be perjury under the law, unless it is somehow material to the topic of the legal matter. Bob is called to testify in a robbery case. While on the stand, under oath, Bob lies about whether or not he saw the defendant at the restaurant which the defendant stated as his alibi. Because this is a very important issue of the criminal case, Bob has committed perjury, whether his lie is in favor or against the defendant. If, on the other hand, Bob had lied about what he had for breakfast, it would not be considered perjury. Rebecca was with her friends when they decided to shoplift alcohol from a local convenience store. When interviewed by the police, Rebecca said she was at home, and didn’t know what her friends were doing that night. Although Rebecca clearly lied about her whereabouts and what she knew, she has not committed perjury. It may have been unwise, but it was not illegal for Rebecca to lie to a police officer, because she was not under oath. Lying, even about immaterial facts, is a bad idea, however. Both prosecutors and defense attorneys can often discredit any testimony by a witness by showing that he has made inconsistent statements, or lied previously under oath. Penalties of perjury vary by jurisdiction, though they commonly include fines and/or imprisonment, up to five years. Judges have quite a bit of leeway when it comes to issuing a perjury sentence. Fines are common as a perjury penalty, and judges may order probation in lieu of imprisonment for a perjury sentence. Perjury is a serious crime that is taken very seriously by the courts. Thus, the severity of the perjury sentence increases, depending on how much of an impact the perjury had on the case. Any individual charged with perjury should seek the counsel of an experienced attorney. In 2009, a team of police officers working in Hollywood, California, chased a man suspected of drug possession into an apartment complex. The three officers testified that, as the man ran away, he tossed a black box that broke open, revealing its contents of rock and power cocaine, and that the officers recovered the drugs immediately. The prosecution of the man rested squarely on the written reports and testimony of the three police officers. Officer Manuel Ortiz testified that he had nothing to do with the search for the drugs, yet in his written report of the incident, Officer Ortiz had written “assisted in locating evidence.” The defendant’s attorney brought the trial to a screeching halt when he introduced a grainy video recording that showed the officers searching for the drugs for more than 20 minutes, and proving that Officer Ortiz was the one who actually found the drugs. The recording also showed the officers conspiring to be “creative” in their report writing in order to make the criminal charges stick. Because the officers lied, and colluded together on this crime, the defendant’s charges were dropped. Additionally, all three officers were convicted of multiple counts of perjury and collusion. The prosecutor pointed out that the officers had committed “just about the worst crime,” when they chose to lie and manipulate the justice system. Misdemeanor – A criminal offense less serious than a felony; generally those punishable by a fine, probation, community service, or imprisonment of less than one year.